Talat Mahmood was a symbol of finesse in manners, language and singing. During good old days, in the Indo-Gangetic plains of Northern India there were three great centers of distinctly different cultures. Calcutta was the home of Bengali culture Lahore was the center of Punjabi culture and Lucknow used to be the heart and soul of Urdu culture. Hailing from an old “Nawabi” (princely) family, Talat Mahmood was brought up in the cradle of sophisticated Urdu culture. He was born on February 24, 1924. Since his childhood he was fond of good music and fine poetry. Lucknow used to host night long sessions of concerts by great classical masters. Talat Mahmood used to stay awake all night to listen to India’s best. And he used to sing a lot while being alone at home. His father discovered his talents and got him enrolled in music in Lucknow’s famous Maurice College. At age sixteen he became a casual artist at All India Radio Lucknow, where he used to sing Urdu Ghazals. This stint at All India Radio got him a lot of fan following. The people would like him to sing in private “Mehfils”. At age seventeen in 1941, on the advice of some sincere friends, he moved to Calcutta, which was the then largest center of films and all kinds of fine arts in India. Talat Mahmood got instant acceptance by the listeners. He started as an “Urdu Ghazal” singer, but sang some equally appealing “Hindi Geets” too. He also sang some religious songs called “Naats”, which became quite popular. Talat knew that while in Rome do as the Romans do. He learnt Bengali and sang some Bengali songs too. The Bengalis instantly liked his soft style of singing, which is a hall mark of Bengali melodies too. Talat recorded some two hundred 78rpm gramophone discs in Calcutta. In 1944, Talat Mahmood attained instant fame when he sang a landmark “Ghazal” with words “Tasveer teri dil mera behla na sakegi”. This became a hit all over India and Talat became a household name. Talat Mahmood wanted to be a singing actor like Frank Sinatra. He acted in three Calcutta made films “Rajlakshmi”, “Tum aur Main” and “Samapti”. Some friends again advised him that Bombay was fast developing into the prime center of Urdu/Hindi film industry in India, relegating Calcutta to the second spot. Famous Bengali music directors like Anil Biswas, Sachin Dev Burman and Ram Ganguli were already camped in Bombay. The writing on the wall prompted Talat Mahmood also to change his base. By late 1948 or early 1949, Talat Mahmood had moved to Bombay. The reigning doyen of music directors Anil Biswas gave him his first chance to sing a song with words “Shukriya aye pyaar tera shukriya” for a soon to be famous film “Aaram”. Talat Mahmood had a peculiar vibration in his rendition, which was accepted by the Calcuttans, but he was not sure about the taste of the Bombayites . He first tried to suppress this natural vibration, but Anil Biswas told him to keep it as it uniquely suited his style. Film “Aaram” and Talat Mahmood’s voice in it, drew the attention of all the poets associated with the film-line towards this new singing star. They discovered the perfection with which Talat Mahmood could pronounce each word of Urdu lyrics. None of his contemporary film playback singers could pronounce Urdu words with poise, perfection and ease that flowed from the throat of Talat Mahmood. Both music directors S. Mohinder and Sardul Kwatra admit that Talat Mahmood became the choice of all the Urdu lyricists based in Bombay’s Film World. From the point of view of technique of singing and mastery over classical music, both Manna Dey and Mohammad Rafi were ahead of Talat Mahmood, but in softness of voice and sophistication in pronunciation Talat Mahmood was ahead of them. Mohammad Rafi being more versatile in the art of actual singing was on the contrary the choice of most of the music directors. This led to Talat Mahmood singing the best written “Ghazals” and Mohammad Rafi singing more Hindi Geets and “Urdu Naghmas”. Other playback singers like Mukesh, Manna Dey, Hemant Kumar and Kishore were pushed further down the ladder, though Kishore Kumar became more popular during the anti-indigenous rock, disco and pop phase in Indian film music. During the fifties Mohammad Rafi was the most prolific film singer, but Tatat Mahmood sang more of the sophisticated and sad poetry. In Bombay Talat Mahmood experienced very different phenomena. In Calcutta every one communicated in Bengali, but in Bombay, the language at the sets of the movies was a mixture of Urdu and Hindi (according to Pandit Nehru it was Hindustani), while off the sets Punjabi was spoken by most of the film folks. Actors like Prithvi Raj Kapoor, Raj Kapoor, Shammi Kapoor, Dev Anand, Rajinder Kumar, Sunil Dutt and character actors like Manmohan Krishan, Jagdish Sethi, Romesh Thakur, I.S. Johar, Pran Nath, K.N. Singh, Om Prakash, Sunder and actresses like Suraiya, Shyama, Geeta Bali, Kuldip Kaur, Beena Rai etc all spoke Punjabi while being away from the sets. Marathi was the language of the area, but in the film-line Punjabi and Urdu were the languages of communication. 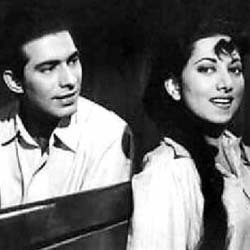 Talat Mahmood’s best friends like actresses Suraiya and Shyama mostly spoke Punjabi during informal chit chat. Music Director Vinod was an astute chooser of voices for his soulful tunes. He had the distinction of introducing Talat Mahmood to singing of Punjabi music and his debut song in Punjabi, recorded for a Punjabi film “Mutiar” had its tune very carefully composed by Vinod. This film was made in 1951. Surinder Kaur was still in Bombay, but was packing up to shift to New Delhi, where she earned a lot of name and fame. Vinod got a duet recorded in the voices of Talat Mahmood and Surinder Kaur. The wording is “Ho chann ve, badli de pichhon chori jhatiyan na paa”. Vinod composed a very emotional tune for Talat Mahmood to sing a solo song for the same film “Mutiar”. 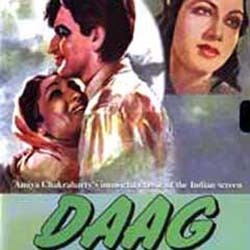 Its first version was recorded in Urdu; the wording is “Ai gham mujhe jaane de, jis raah pe jaata hoon”. Talat sang it by immersing himself in romance and pathos. Later on its Punjabi version was also to be recorded. The possible wording was “Ai gham mainoo jawan de, jis raah te janda haan”. I do not know whether the Punjabi version saw the light of the day or not, but after listening to the Urdu version you can judge the beauty of the tune and its superb rendition. Talat Mahmood wanted not only to sing songs in Punjabi, but also wanted to learn the art of speaking chaste Punjabi. About this he confided later on with music director Sardul Kwatra. Sardul taught him the basics of Punjabi language during the recording sessions of music for the Punjabi film “Kaude Shah”. However, for mastering the art of speaking the language, Sardul told Talat Mahmood to dwell for sometime either in Lahore or in Amritsar from where most of the actors, actresses, writers, music directors and poets have migrated to Bombay. This was very hard for Talat Mahmood to do, because all along during the fifties he was in great demand in Bombay. Sardul Kwatra had heard the Talat Mahmood – Surinder Kaur Punjabi duet. He loved Talat’s tonal quality. While composing the music for Punjabi film “Kaude Shah”, Sardul composed most of the songs to be sung by Shamshad Begum, but one duet he composed for Talat Mahmood and Raj Kumari. The lyrics are “Zulfan ne khul gaiyan, akhiyan ne rul gaiyan, ki khatiya e dil laake”. The duet although was very sad, but it did very well in terms of sale of records. The best selling song of film “Kaude Shah” was a Shamshad Begum number bearing lyrics “Chhann chhann kardi gali de wichon langhdi ve mere sajna di dachi badami rang di”. But the Talat Rajkumari duet closely followed it in sale of discs. Talat was featured in a couple of other songs in film “Kaude Shah” including a chorus. Film “Kaude Shah” introduced the spice of Punjabi to Talat Mahmood. While on a trip ro Punjab, Talat Mahmood exhibited his love for Punjabi during the late sixties. On a fine wintry evening Begum Akhtar accompanied by Talat Mahmood visited Chandigarh in connection with a “Mirza Ghalib Nite”. While receiving the audience’s requests for the “Ghazals” to be sung, Talat was seen mumbling some words in Punjabi too. I was wonder struck to observe Talat Mahmood’s eagerness to learn and speak Punjabi. On the other hand we, the home grown Punjabis are abandoning this sweet language and trying to speak Hindi or English. Is this sheer inferiority complex or something else on our part? Talat Mahmood is no longer with us. But his sweet memory shall linger for ever. Who so ever loves Urdu poetry and its soulful, sensuous rendition shall fondly remember him. He was loved by the lovers of melody and sublime lyrics. Talat had more female fan following compared to any of his contemporary playback singers. Thanks to the advancements in recording, reproduction and listening technologies, his music shall live for ever and make him immortal.